The audio of 36 Vayathinile was released yesterday, 6th April in Chennai. The movie marks the return of Jyothika back to the silver screen after 8 years. The film is produced by Suriya’s home banner 2D Entertainment. A couple of things stood out at the launch event. For all those Jyothika fans, it was indeed a great day to see their favorite heroine returning to what she does the best and to a spot where she belongs- in front of the camera. But more than that, the way she addressed the gathering and made her speech in Tamil is something that was quite endearing. It sure was not a prepared speech and was an earnest extempore that touched the audience. The genuineness was all evident. She thanked each and every one from her family and the crew members of 36 Vayathinile for making her return a memorable one. The highlight was very definitely Jyothika thanking her domestic help Devi. She called out for Devi and acknowledged the support rendered by her for taking care of her kids like a mom. At a time when ‘please’ and ‘thank you’s are extinct commodities, Jyothika surely needs a special pat on her back for remembering every individual who helped her in her endeavor. Kudos Jo! 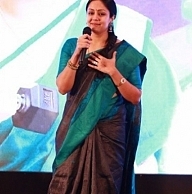 After A Delay, Jyothika's 36 Vayadhinilae Now Has A Date!!! Suriya Vs Jyothika This Summer. People looking for online information on 36 Vayadhinile, 36 vayathinile, Jyothika, Rosshan Andrews will find this news story useful.